Key Link Aluminum Railing is manufactured in Lancaster County PA. And engineered to highest standards for both Residential and Commercial use. Our Railing products combine quality construction with ease of installation enabling users to create beautiful and distinctive outdoor spaces with abundant options. The American Series is one of our most popular railings, and it’s easy to see why! The flat-top rail, contemporary profile, and multiple color choices make this railing really stand out. Made with heavy wall aluminum, powder-coated with AAMA 2604 coatings, and completed with PVC inserts for rattle-free enjoyment, these railings will last for years. The American Series has 3 standard color options, 10 special order colors, and nine infill options, including vertical or horizontal cable rail for a modern, open look. Every boxed section includes top and bottom rails, mounting brackets and hardware, and the installation guide. A Contoured, Modern Look for Your Home. 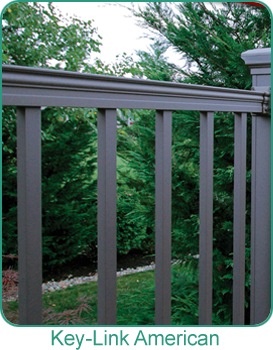 The slim-profile Arabian Series brings a beautiful, modern look to your porch, deck, or balcony. The rounded and graspable top railing gives this series its elegant appearance. 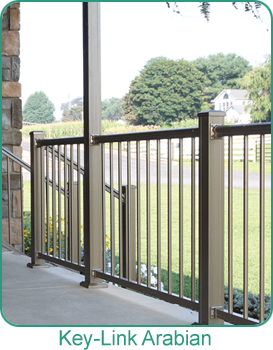 Strong, lightweight aluminum makes the perfect material for a low-maintenance, highly durable railing. And thanks to the powder coating, the colors will be protected from fading for years. With nine infill options, including horizontal cable rail, and the most standard colors of any of our rail, this series is ready for your complete customization. Add style and polish to your outdoor living area with the sleek Outlook Series. The Outlook is a secure, cost-effective way to bring safety to your space. 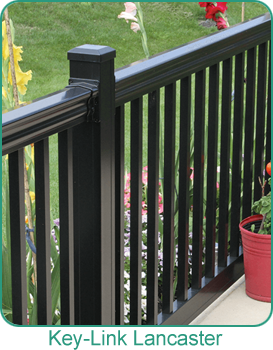 The Outlook Series, like all of our railing, is easy to install and includes a limited lifetime warranty. It’s designed to give you years of low-maintenance enjoyment. With six on-trend colors and a handsome square baluster, this series works in almost any setting. Stately and traditional, the Lancaster Series’ gives your space a warm, inviting feel. The substantial 2.8” top rail makes this feel like a heavy-duty system, but without overwhelming your space. Made of high-quality aluminum, this railing gives you years of beauty and style—with almost no maintenance required. 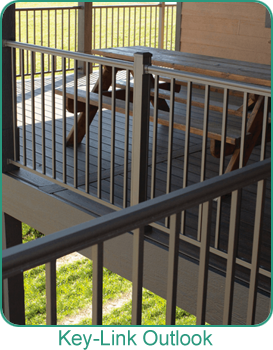 There are three standard color options, ten special order options, and five handsome baluster choices, so you can customize the Lancaster Series railing to your taste.